This past weekend, our church had the pleasure of hearing stories and testimonies from a few of our students who recently returned from summer mission trips. We had over 300 students, ranging in ages from 6th grade to high school seniors, who committed to spend a part of their summer serving others. From inner city Houston service projects to caring for displaced Iraqis in Jordan, a common theme echoed throughout each testimony…..joy. Our students were continually in awe of how many of the people they served had joy even in the midst of their circumstances. I believe one of the major reasons why these people could continue to be joyful is that they refused to compare themselves to others. There is no win in comparison. We either feel superior to others or we feel inferior to others. As Andy Stanley once mentioned, there is always someone with a bigger “er”… someone skinnier, someone richer, someone prettier. Their kids are smarter, better, nicer. Their house is bigger, their car is newer….the list can go on and on. A sad side-effect is that we are then truly unable to be happy for or celebrate with those around us who may have “more”. In the parable of talents, Jesus, the master story-teller, describes three servants who were entrusted with a certain amount of money while their Master was away. They were each given a set amount based upon their abilities. Two of the servants used the money wisely while one of the guys simply buried it in his yard. When the Master returned, he was extremely pleased with the actions and responsibility of the first two servants and rewarded them accordingly. Needless to say, the Master was not happy when he heard the report from the last servant. He had failed to use the gifts given to him. It is important to note – the last servant didn’t do anything bad…he just didn’t do anything! What is even more interesting about the last servant is his response to the Master. He blamed the Master for his failures, for his unwillingness to leverage and multiply the gift he was given. 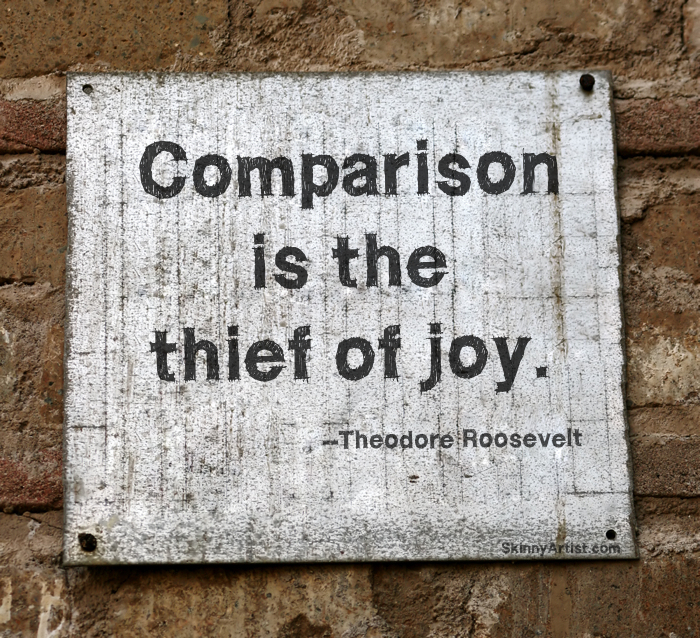 When we compare ourselves to others we are in essence saying God it is your fault. You did not give me enough….or….God you gave them too much. God you could have made me smarter, prettier, richer…and the list goes on. God, if you would have just given me more I could have done more. We have all been entrusted with certain things, certain talents, certain circumstances and certain experiences that only we have. We must move from wanting more or wanting different and realize that what you have is less important than what you do with it! Remember, there is no win in comparison.